NICHOLS — On the roads and fields around Engelbert Farms in Nichols, there’s a layer of mud that complicates cleanup from last week’s flooding. Where it is shallow, it can be slippery. Where it is deep, it swallows boots. 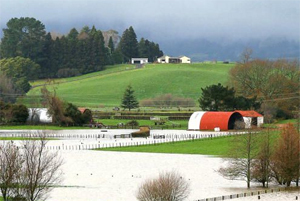 The flood, triggered by back-to-back tropical storms, caused $1.125 million in damages to the farm, according to Kevin Engelbert, 54, who, with family members, owns the certified organic dairy farm. The flood damaged buildings and equipment, spoiled animal feed and disrupted milk production, and contaminated wells at the farm near the Susquehanna River. New York Agriculture Commissioner Darrel J. Aubertine on Thursday toured the farm, and others nearby, to see the damage for himself. Farms across the Northeast are in peril after rain and floods washed away everything from crops, farm buildings, soil, livestock and animal feed. The federal Farm Service Agency estimates that the floods spawned by the remnants of Hurricane Irene and Tropical Storm Lee caused $45 million in damage to farms across New York state. “The devastation is just, until you actually see it, and can walk around it, pictures just don’t do it justice,” said Aubertine, who owns a farm himself. Aubertine looked at the largest silo on the farm. The staves on the silo were beginning to crack and push outward as the flood-soaked corn inside expanded. “We’re not sure what we’re going to do. We’ve got to try to save the corn above (the wet corn) but we don’t really want to work around it right now,” Engelbert said. A silo repairman will determine whether the staves can be shored up with hoops so that the dry corn can be salvaged from the top, he said. “We don’t dare go over there really, until we see what he says,” Engelbert said. Farmers will likely get aid from both the state and federal governments, Aubertine said. On Thursday, U.S. Sen. Chuck Schumer, D-N.Y., asked the U.S. Department of Agriculture to waive interest on emergency loans to farmers affected by the floods. At the state level, a fund of $15 million is available for relief, he said. Of that, $5 million is earmarked for conservation and cleanup. The state is still working out details for how best to use the remaining $10 million, Aubertine said. Much of it may be used for feed and helping vegetable and fruit growers buy produce from other sources. “We’re working with other organizations, be it the farm bureau, Cornell Cooperative Extension or the soil and water agencies to do all we can to help with the cleanup, but knowing full well that even the long-term, more major problem is going to be that of feed,” Engelbert said. A livestock farm needs to feed its animals before it can get back to business. For now, the Engelberts’ cows are on a friend’s farm uphill and are being fed a mixture of feed that was stored away from the farm and grain sourced from Penn Yan. Aubertine advised the Engelberts and other farmers to keep track of their cleanup expenses. “Any program that may come about will require documentation to access the benefits. … so I encourage everyone, if you rent equipment, keep track of that. Keep track of labor, keep track of fuel and expenses. After the visit, Engelbert reflected on the floods of 2006 and 2011.